Once the bug of doing your own haircut with clippers bites you, it won’t let go. Forget about it making sense in terms of saving $$$. It’s seriously addicting! However, cutting your own hair can also get confusing. There’s a scary amount of hair clipper sizes! Thought that blades are easier? Oh man, think again when you see all these clipper blades on Amazon.com too. Me and Alex compiled a full guide for you, including a concise infographic with guard lengths. You’ll find anything from Andis detachable blades chart or Andis purple magnetic guard sizes, to Oster guards/blades or Wahl guides charts. Navigate to whichever part interests you the most to learn more about these different hair clipper sizes! Let’s start with Andis’ most popular accessory: the brand’s Nano magnetic combs. The company divides them into two sets – five shorter magnetic guards and four longer. The reason these are so revered is their tight and secure fit, durability and facilitation of more precise, easier haircuts. In addition, they are compatible with some other hair clipper models. For example, Andis magnetic guards will fit Oster Fast Feed without any problem. Just make sure you get the double magnetic guards. Here’s the Andis magnetic guards size chart itself! A few of Andis professional clippers come with ceramic blades. What’s great about them is their cool operation mode, their longevity and, you know, their overall style. Ceramic blades for Andis clippers will net you up to 70% cooler blade operation, which is great for heavy-duty haircuts. An alternative would be the UltraEdge blades which, however, are not made of this material. The most popular model rocking the CeramicEdge blades is Andis BGRc, an amazing barber clipper we’ve reviewed thoroughly. Andis detachable blades also fit other top hair clippers like the Oster 76 Classic. Here’s the ceramic Andis clipper blades size chart to help you out. *All Andis detachable blade clippers can use the Andis comb set for detachable blades. It consists of Andis guards sizes 0 to 8 (1/16″ to 1″) and fit a #000 blade perfectly. Provides you cool operation mode, longevity and, overall style. Oster detachable blades are an art of their own. Made of high-carbon steel, they go through freezing cold conditions and rigorous in-house testing. As a result, they are hardened to the spectacular RC62-66 Rockwell Scale. If that doesn’t speak anything to you, let’s put it this way: they’re ultra tough, ultra sharp and will last you a long, long time. That’s how the Oster Cryogen X blades work. As Oster detachable blade clippers have hordes of fans, we’ve compiled all Oster clipper blade sizes for your convenience. And if you’re wondering: yes, this is a compatible Oster Classic 76 blades size chart too. I’ve had a few people asking me about “Oster Fast Feed magnetic guards”, as they call it. I’ve discussed this before: there’s no such thing from Oster. You simply get Andis Nano double magnetic combs and use them with your Fast Feed clipper. Easy as pie and way better than any plastic comb, in my opinion. The last member of the holy trinity of the most popular hair clipper brands is Wahl. You’ll see quite a few Wahl clipper reviews around the website with a reason. Alex is especially fond of them, while I lean more towards Oster and Andis. There’s quite a few types of Wahl guards around. Let’s first get to the clipper guard sizes and the chart. We’ll discuss the types afterwards. Note: Wahl clipper hair clipper sizes include the #10 and #12 comb. If you’re looking for Wahl replacement guards, or just something to style your haircut sizes with, you’re in luck. There are three main types of Wahl clipper guards the brand has in stock for you. 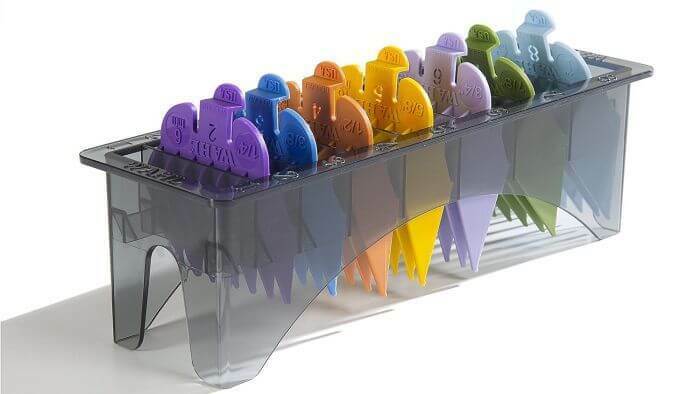 First, there’s the colored plastic combs on Amazon.com. Each color corresponds to a specific size. This is perfect if you’re using a home hair clipper for all the family. If everybody’s haircut sizes differ, it would be quite the hassle, no? These combs make it easy to distinguish which guard you should use for a 2 guard haircut and which for a number 2 haircut, for example. 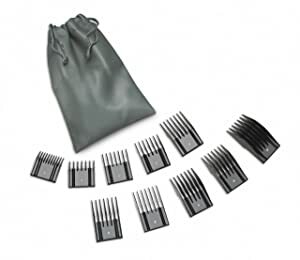 Exactly the same as colored combs, the Wahl black hair clipper guide combs from Amazon.com are your standard kit. Nothing spectacular about them – just your usual accessory to spice up your home haircuts. Things are a little bit different with the Wahl metal clipper guards from Amazon.com. They run more expensive than standard combs, but also bring you a premium approach to hair clipper sizes. With the 1/2″ and 1 1/2″ Wahl guide with metal clip you’ll be achieving fades you wouldn’t get that easy with the simply plastic combs. This is just pure luxury and will complement any Wahl 5 star clipper you have for all hair clipper sizes. We sure hope these collection of clipper guard sizes in charts would help you perfect your haircut. Not only this – but also improve your knowledge on cutting your hair with clippers and general understanding of these awesome machines. We did go deep into hair clipper sizes, but we might have missed something out. If that’s case and you want to see us providing you with additional information, let us know in the comment section! Looking for comb guide #10,#12 & #14 with metal clips. Where to find them? Thanks. 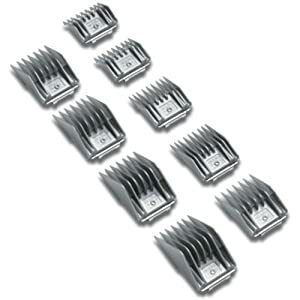 Unfortunately, we haven’t seen any metal guards longer than the #8 included in Wahl’s set. Seems like they have limited the premium feature to shorter, more ‘standard’ sizes. U have the wahl clip/comb sizes listed incorrectly, there is no zero comb for wahl there is the half clip and where is the 1 and 1/2 clip? Also a number 2 detschable blade is well known througHouten the industry to be longer then the detachable 2 blade, you have it listed that the detachable 2 leaves the hair longer. Why? Oops, you’re right about the #1/2 — I noticed just now that we’ve listed it as a #0 like Andis and Oster. Our bad. Regarding the detachables, I didn’t quite understand you. The detachable blade sizes are taken in accordance with what the manufacturers (Oster, Andis) have pointed out in their official pamphlets and websites. I have the wahl clippers and blades #40,10,7,5,4 and 3 1/4. I just purchased the wahl guides but I don’t have a clue to which blades I am supposed to use with them. Do I just use the #40 or #10 or do I use all the other blades depending on the extra length I want? This is a set of dog clippers you’re talking about, right? Human clippers don’t have sizes like #40, #10 etc. It’s a matter of personal preference – some people groom only by switching blades, others by further attaching guides. Which guides did you buy, btw? Human clippers and dog clippers differ a bit. #10 is the most standard dog clipper blade you’ll see on most clippers. Beginners tend to use it, as it leaves hair long enough to be comfortable for most breeds. Just keep in mind that some clippers can get hot. Make sure you have a cooling spray/make pauses from time to time! Hey man, nice post. One question remains though. What size is it when I have my Oster Fast Feed closed with Andi’s magnetic combs? Is it Andi’s magnetic combs + 0.5 mm? On a wahl senior, when the blade is closed with no guard it is 0.5mm. How many milliliters is it when the wahl seniors are all the way open with no guard? Is it 1.4mm? You mean the regular Seniors, not the 5 stars, right? It should be the length of ~#1/2 Wahl guard, or roughly 1.5mm when it’s open without a guard. I have oyster classic 76. Can you use Andis blades with them? 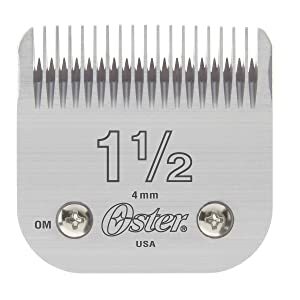 If so have you noticed a difference in those blades vs oster. You CAN use Andis blades with Oster clippers (and vice versa.) And they would work somewhat well, but there’s a small issue: the hinges. Oster clippers are manufactured so they have narrower hinges; Andis are wider. This could make blades noisier and affect their cutting precision. So my question is , like what # guard 0a 5/16 speed-o-guide, is equivalent to what Wahl or Andis purple guard? If you’re talking about the 5-in-1 fine blade, it’s usually used for pets and not humans. Can you confirm which one is it? Animal clipper sizes and human clipper sizes differ a lot. I have a Moser 1881 which has a 1 9/16 inch head. (Or 39.5mm). Can I use standard Wahl (or similar) guides on it? Hello, I’ve just purchased the wahl chromado lithium, Will these guards fit. Also I’m used to using guards #1 to #6, how do I convert the sizes. Hi Celia. Thanks for your question. Unfortunately, you cannot interchange the guards for the Wahl Chromando Lithium. You have to use the 5-in-1 blade. Hi! Does all the wahl guards fit to all wahl clippers? Hi Morgan. Thanks so much for your message. From what I can see, the color-coated plastic Wahl guards should fit Wahl full-size clippers, which excludes trimmers. The Wahl metal clipper guards are compatible with most full-size clippers with the exception of Wahl’s competition series and detachable blades. On the Wahl right and left ear taper guards, can anyone tell me what the equivalent guard size is for the two sides? It looks like it may taper from a 2 guard on the high side to the 1 guard on the short side but I am not sure. I wish they made different lengths on the tapered guards, I think they could really help with fading. Hi Jason. Good question. The Wahl left and right ear taper guards range from 1/8” to 1/2”, so the equivalent guard size would be a 4 on the high side and a 1 on the low side. That’s a good idea. I definitely agree with you there. 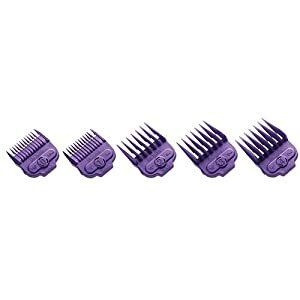 The Wahl #12 or 1 + 1/2 inch guard is not the largest guard size designed for human hair. There are actually generic #16 guards made for Wahl Clippers made by a 3rd party company which allow the hair to be cut at roughly 2 inches long. I believe the company that makes them is called Clipquik and they are compatible with Wahl clippers and maybe Conair clippers also. If your clipper has a side-lever for adjustable length then you can even get it to cut the hair at almost 2 + 1/4 inches long. I wear a shorter classic style mullet hairstyle and either use the #12 or #16 guard with the long lever setting for one length on the front, top, and sides. There is no tapering. I use a vacuum electronic haircutter (not mentioned on this site) or have another person cut / trim the longer portion of hair in the back. I’ve been self-cutting my hair in this style since 2005 with little changes made since then.